The San Luigi Orders comprise four interrelated entities; the Orders of the Crown of Thorns, of the Lion and the Black Cross, and of Antioch; together with the Grand Prix Humanitaire de France et des Colonies which is the Cross of Merit of the Order of the Crown of Thorns. The Orders of the Crown of Thorns and of the Lion and the Black Cross are Orders of Chivalry according to the historic definition of that term. They were revived and founded respectively by the first Prince-Abbot of San Luigi on 15 October 1883, during his period of effective sovereignty in the Fezzan. 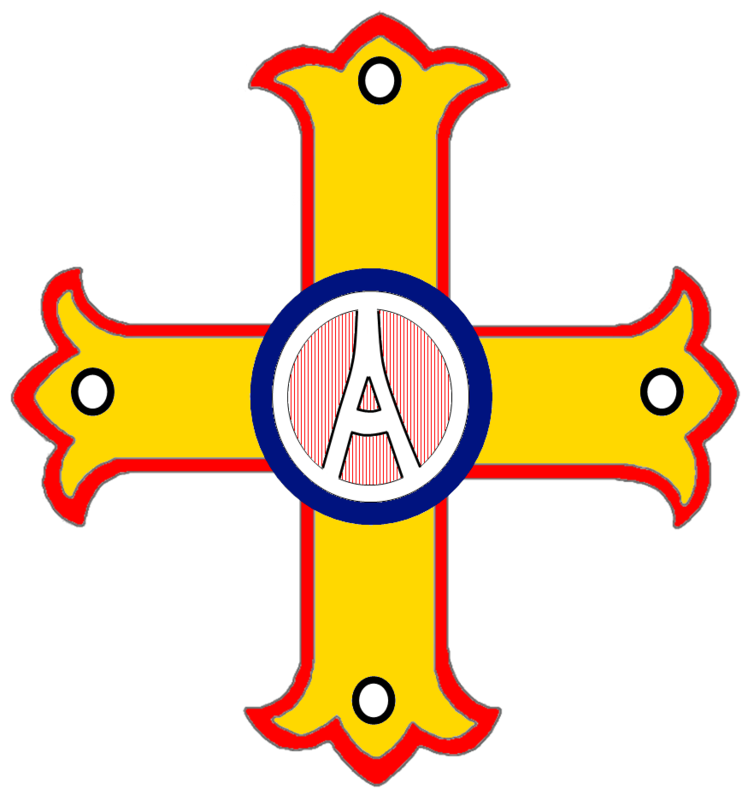 The Order of Antioch is a religious order and is described separately. From 1960 onwards each order was placed under a High Protector. In the case of the Order of the Crown of Thorns, this was the late King Peter II of Yugoslavia and since his death in 1970 this position has been left vacant in his memory. The Order of the Lion and the Black Cross appointed as its High Protector the Crown Prince of Japan, now H.I.M. Emperor Akihito. 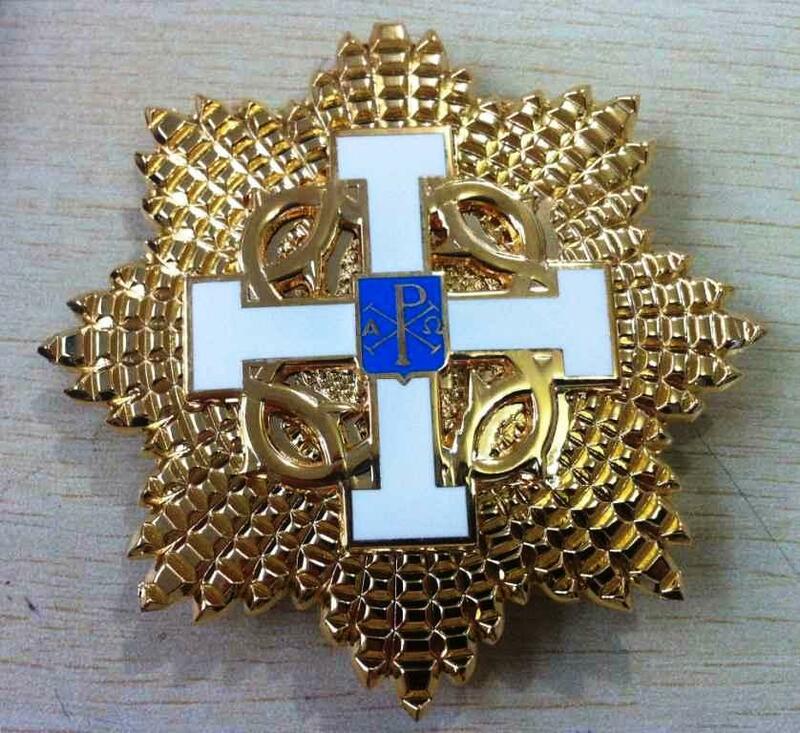 The Order of Antioch appointed as its High Protector H.I.R.H. Prince Louis Ferdinand of Prussia, who died in 1994, since when this position has been vacant. Since 2012, H.M. the Omukama of Bunyoro-Kitara has been a Royal Patron of the Order of the Crown of Thorns and the Order of the Lion and the Black Cross. H.S.H. the Most Revd. Prince Kermit de Polanie-Patrikios also served as a Royal Patron of the San Luigi Orders until his death in 2015. In addition, the Prince-Abbot of San Luigi is responsible for the protection of several other Orders which are listed below, and in his capacity of Head of the Royal House Polanie-Patrikios is Prince Grand Master of the dynastic orders of that House, known as the Royal Byelorussian Orders. Membership of the San Luigi Orders is conferred by the Prince Grand Master following either a personal invitation extended by the Grand Magistry or the recommendation of individuals of high standing by existing members. In the modern era, the Order was re-established on 1 June 1891 on the authority of the Syrian Orthodox Patriarch, His Beatitude Ignatius Peter III/IV, who was also responsible for authorizing the consecration to the Episcopate of the fifth Prince-Abbot, Archbishop Joseph-René Vilatte (Mar Timotheos, Prince-Abbot Joseph III), in 1892. The petitioner for this authority (who had submitted his petition over a decade earlier, in 1880) was the Revd. Gaston Jean Fercken (1855-1930) who was a priest in the Protestant Episcopal Church of the United States of America and worked closely with Prince-Abbot Joseph III during the early years of the Order. In 1892, the 1922 History relates, “Patriarch Ignatius Peter III, the successor of St Peter, sent for Mar Timotheus I, who had been consecrated metropolitan archbishop for work amongst the Orthodox Catholics in America by Julius I, Archbishop of the Syrian Church in Ceylon, in accordance with the Bulls issued by the Patriarch, and conferred upon him the Grand Mastership of the Order of the Crown of Thorns, and intrusted to him the regulations of the Order.” Whether or not this act was undertaken with Fercken’s knowledge and consent is not clear. In any case, on 30 May 1893, Fercken resigned the Grand Mastership so far as he was concerned in favour of Mgr. Vilatte. Meanwhile, a separate Order of the Crown of Thorns had been founded together with the Order of the Lion and the Black Cross by Prince-Abbot Henrice on 15 October 1883. By decision of Prince-Abbot Joseph III, who was consecrated by the Syrian Orthodox Church and therefore accorded primacy to the 1891 Order under the authority of the Patriarch, this branch was absorbed into the 1891 Order when both came under the same headship in 1899. The Order has as its aims (1) to defend the Christian Ideology, Tradition and Cultural Inheritance; (2) to preserve the best ideals of Knighthood of past centuries and the noble spiritual virtues of the Knights Templar; and (3) to help forward the complete re-establishment of the Abbey of San Luigi, and any charitable works under its Patronage. The Order also has the aim of rewarding persons who have distinguished themselves in defence of the Church, of humanity, or in philanthropic work initiated by the Order and have shown a Christian spirit, a clean life and a noble example. Membership of the Order is confined to baptised Christians who accept the Nicene Creed in its natural interpretation. The Statutes of the Order, which give full details of its protocols for membership and related activities, can be read here. The historic Statutes of the Order issued under Prince-Abbot Joseph III in 1900, 1922 and the additions effective in 1938 are all in the possession of the Abbey-Principality, and can be read on the historic documents page. 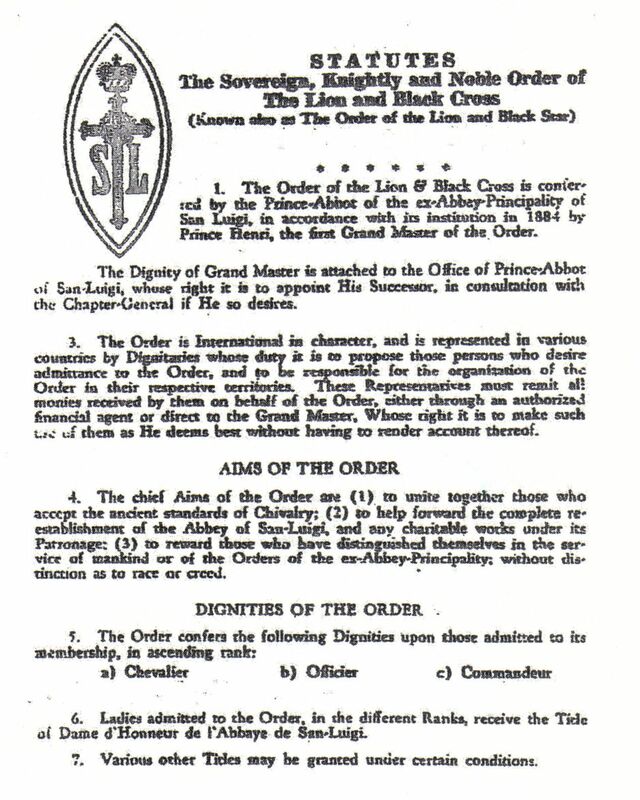 (2) The Sovereign, Knightly and Noble Order of the Lion and the Black Cross (L’Ordre Souverain, Chevaleresque et Noble du Lion et de la Croix Noire), also known as the Order of the Lion and the Black Star. This Order of Chivalry was founded by the first Prince-Abbot of San Luigi, Revd. Fr. Dom Henrice Pacomez, on 15 October 1883. The symbolic Lion represented is the Lion of Judah, which overcomes the Cross in its act of salvation. It has as its aims (1) to unite together those who accept the ancient standards of Chivalry; (2) to help forward the complete re-establishment of the Abbey-Principality of San Luigi in the Fezzan, and any charitable works under its Patronage; (3) to reward those who have distinguished themselves in the service of mankind or of the Orders of the Abbey-Principality, without distinction as to race or creed. It is thus open both to Christians and to non-Christians. The original Statutes of the Order, published in 1899 under Prince-Abbot Joseph III, and their revision in 1934-35 are in the possession of the Abbey-Principality and can be read on the historic documents page. This Order was planned by Prince-Abbot Joseph III de San Luigi and organized in 1928 by Archbishop the Hon. Frederick E.J. Lloyd, Primate of the American Catholic Church and a former member of the House of Representatives for the State of Illinois. It is a religious order originally open only to bishops (now also open to priests and deacons) who can establish their Apostolic Succession from the Syrian Orthodox Church. After the death of Archbishop Lloyd in 1933 the Order developed under the leadership of the Rt. Revds. Dr Howard Ellsworth Mather and Dr. Frank Dyer. Dr Dyer in the 1920s built what is now the Wilshire United Methodist Church, a California historical monument. In June 1963 the legal title to the Order was inherited from Dr Dyer by Prince-Abbot Edmond II de San Luigi. The Order was at one point the principal gathering-point of clergy of the Vilatte succession, and today continues to admit to membership those who serve in the churches that descend from his foundations. Its activities are described in the Ecclesia section of this website. 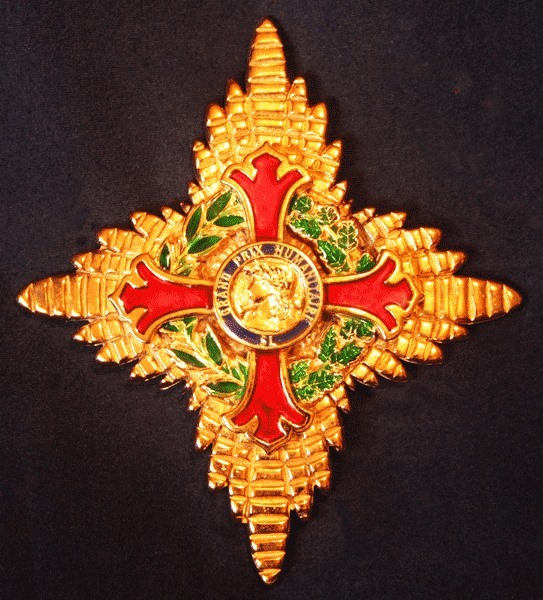 This award was established on 18 September 1892 by M. Charles Leroy and subsequently became attached to the San Luigi Orders in 1899 as part of the transfer of Prince-Abbot Louis-François, when it was designated as the Cross of Merit of the Order of the Crown of Thorns, this being confirmed in the succession document in favour of Prince-Abbot Edmond I of 1923. A description is given in the statutes of that Order from the 1930s, and in the 1953 history of the Orders. This award was originally intended to honour those who had strived in the service of saving human life “to save their fellow rescuers and particularly at sea.” Subsequently, its scope was expanded to an award limited to a maximum of ten per year and usually four or less. The Grand Prix was formerly under the Patronage of the late Sawai Man Singh II, the last Maharajah of Jaipur. With its attachment to the San Luigi Orders in 1899, the Grand Prix Humanitaire de France et des Colonies acquired an international character and ceased to be purely a French award. Although it preserves its original title, today the present-day Grand Prix has no organizational connection with the French Republic or its former colonies, and is a purely commemorative and chivalric award. It is not possible to apply for this award, which is conferred rarely and with an annual limit on the number of recipients. Nominations of deserving candidates may be made to the Prince-Abbot by existing members of the San Luigi Orders. The Statutes of the Grand Prix can be read here.